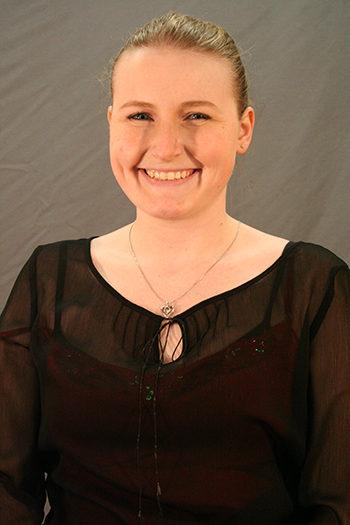 Cowley College sophomore Paige Lundin was recently named the school’s March Student of the Month. Lundin, the daughter of Juanita Bright and Richard Lundin, is a Theatre major at Cowley College. Prior to attending Cowley she graduated from Wichita Northwest High School in 2014. At Northwest, Lundin was involved in the school’s theatre productions and choir. Lundin has a sister, Hailey 22. Her grandmother Patricia Vega resides in Port St. Lucie, FL, and her great-grandmother Karen Zeller lives in Arkansas City. Lundin chose to attend Cowley College after being offered a Scott MacLaughlin Memorial Scholarship and a Gertrude Newman Scholarship. “I really liked the Theatre program on my tour of Cowley and everyone was really welcoming,” Lundin said. At Cowley, Lundin is involved in Act One, Concert Choir, CC Singers, and various theatre activities. “It is really cool to see how involved the community is with everything and how well they support the theatre productions at the school,” Lundin said. Lundin has a 3.78 grade point average and has been named to the President’s and Dean’s Honor Rolls during her time at Cowley. Lundin appreciates the faculty for naming her the school’s March Student of the Month. “It is nice to get recognized for my involvement and hard work to keep my grades up,” Lundin said. Lundin is employed at Cowley College’s Tiger Deli and has enjoyed the opportunity to work for Deli manager Kathy McDonald. “Kathy is so cool, I could not ask for a better boss,” Lundin said. Lundin has also enjoyed learning from Theatre director John Sefel and director of vocal music Marcia Wieland. Cara Kem, dance instructor and choreographer, as well as Mary Prochaska, student costume shop manager, have also been instrumental during Lundin’s time at Cowley. Away from Cowley, Lundin serves as a volunteer for the Cowley County Humane Society. She enjoys riding horses in her free time. After graduating from Cowley in May, Lundin plans to transfer to Emporia State University to major in theatre education. She is currently auditioning for Emporia State University’s Summer Stock which will perform four shows in eight weeks. “Cowley has helped get me ready for this next step,” Lundin said.